New Scheduler is Here in a Limited Release! Customize your view with filtering and viewing options galore! To adequately support our customers in the transition to the new interface, we will roll out new scheduler in phases. About three weeks before your company will begin using the new Scheduling tab, you will receive email notifications and invites to webinars for a demonstration and live question and answer session. If you want to jump in and start learning now, check out the following video and quick guide, otherwise keep an eye out for an email coming soon. The Date Picker icon for several pages throughout the Android app has been updated to use the default Date Picker for Android. 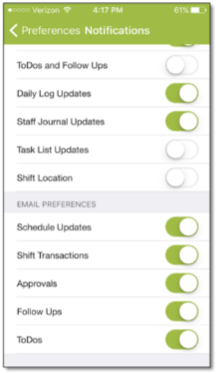 Android and iOS users can now update their Email Notification preferences (including the new Logbook options) without having to log into the web. 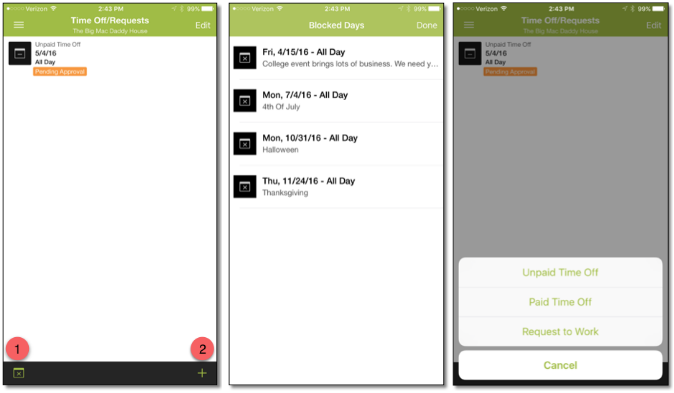 Paid Time Off is now available for iOS users! 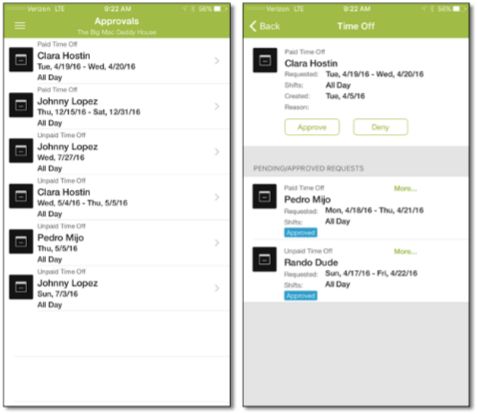 From the new Time Off & Requests menu item, users will be able to submit Paid and Unpaid Time Off, as well as make Requests depending on the company’s permissions. Although the ability to create Blocked Days is limited to the web, users can tap the Blocked Days icon (1) to view if there are any days unavailable to make Requests or to submit Time Off. Tapping the Plus icon (2) will reveal the user’s options which are based on enabled permissions. No matter which option is selected, the layout is the same. 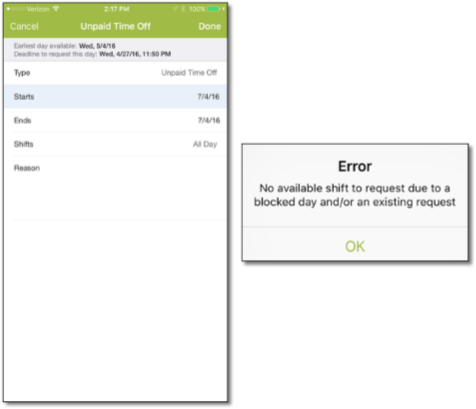 If users attempt to make a Request or submit Time Off on a Blocked Day, they will receive an error. Users can delete their submissions one-by-one by sliding the entry to the left, or in bulk by checking Edit (1) to reveal selection bubbles next to each one, and then clicking Delete (2). Users with access to the Approvals page can view all pending Paid/Unpaid Time Off submissions. By tapping on a specific entry, users can now view all overlapping requests (both approved and pending). 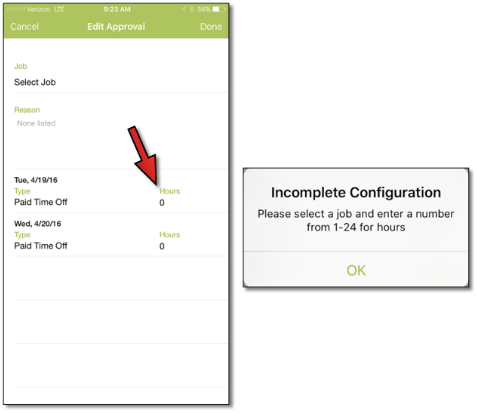 When users go to approve Paid Time Off, they must select how many hours the employee will be getting paid for. If they fail to do so, they will receive an error message. If Making any change in the New Scheduler is in real time, which means that as soon as the change is made, it is reflected on Web and Mobile, as well as in the Roster Report. Posting and re-posting the schedules however, is what kicks off the email/text notifications set up by the affected users, and the messages sent to their HotSchedules Inbox. When a posted schedule requires re-posting, a “Repost Schedules” button appears in the lower, left-hand corner. The red badge indicates the number of schedules that need to be re-posted. 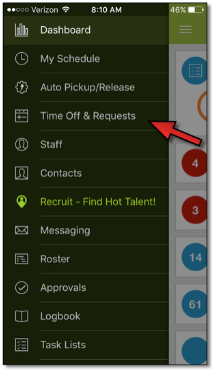 Clicking the button will re-post the schedules that need it, but if the button isn’t clicked before attempting to leave the Scheduling tab, the users will see a Repost Schedule(s) modal to be informed of what action needs to occur. Schedules being worked on for the same week that haven’t been posted yet will not be affected when the button is clicked, which allows the users to post when they are ready. A blue badge in the lower, left-hand corner indicates the number of schedules with at least one shift that need to be posted for the first time. 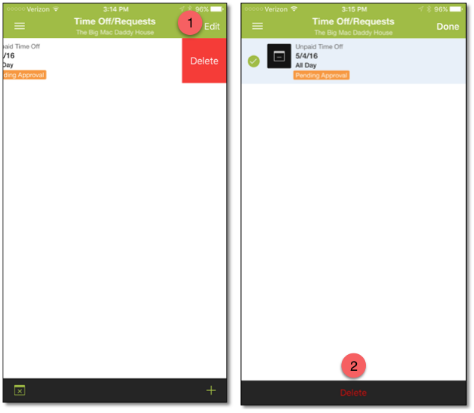 Clicking the Post button will reveal a modal with the schedule(s) available to post, as well as an Information icon that displays the most recent time the schedule was saved when the mouse is moved over it.